Welcome to Ottawa Magazine’s new Political Compass. It is designed by a PhD-wielding political analyst. (That would be me. The PhD is jammed in a book shelf, right near the laundry hamper. Really.) Here’s how it works. You send me an e-mail telling me how you self identify in one of the following political categories: Conservative, Liberal, NDP, Green, Marxist-Leninist, Marijuana Partier, Rhino, Anarchist, Bloc Québécois. Then you send $20 to my PayPal account. I will send a list of questions that will make you feel comfortable in your political skin. We’ll both be happy, but my delight will be far more easily quantified. The CBC has done something like this, except for the $20 donation. You’ve already given at the office. They’ve hired some grad students and academics to put together the quite successful Vote Compass. It has, in fact, become a political football, and the Tories who are kicking it around are right. 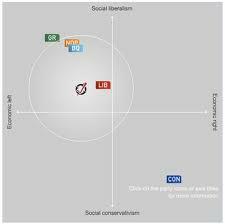 The CBC Political Compass is skewed. First, the creators of Vote Compass have placed the political parties on a graph, using mysterious and quite undescribed criteria. The Greens are literally out in left field, the Dippers are just to the right of the Greens, the Liberals are close to the centre, while the Tories are way out to the right. I used Vote Compass to determine that I am a Conservative. To make the cut, I had to come across as rabidly anti-immigration. I had to oppose any concessions to religious minorities. I was a fiscal hawk, wanted more money for the military, no “Quebec is a Nation” designation for Quebec. I could still be a Tory even though I was okay with gay marriage and opposed tougher pot laws. The creators of Vote Compass must have got their version of the Tory platform from rabble.ca. Except for my views on pot, which I hold simply because I am too lazy to visit friends in jail, The Harper Government© holds none of those positions. Take immigration. No government has let more immigrants into the country each year than Harper’s. Even Pierre Trudeau cut immigration during recessions, and his annual numbers were nowhere near Harper’s. Spending cuts? You have to be kidding. Canada has never had such large deficits. Even the Canadian Taxpayers Federation will have a hard time endorsing the Tories, since their “debt clock” hit a record high this month. More money for the military? Don’t look to Harper. While the government is buying F-35 fighters, the operating budget for the Department of National Defence is shrinking. And if you think the Liberals won’t buy the F-35 if they win the election, well, dream on. Troops out of Afghanistan? This summer, the Harper government is taking out all but the police trainers. Closer relations with the U.S.? The Chrétien government signed off on NAFTA. Tolerance of oil sands pollution? The “tar sands” were the Liberals’ pet alternative energy project in the 1970s and no one squawked much about them being icky until Harper got in. Special status for Quebec? A motion of the Harper government. Abolish the Senate? Seems everyone, including the Harper Tories, want to get rid of the Senate until they get elected. Then it becomes so very handy. There’s no difference in the health care system since the Tories got in. Money for daycare vs. money for stay at home moms? The Liberals never found money for either, though they talked a good fight about national daycare. Sentence young offenders as adults? Liberal justice ministers Anne McLellan and Allan Rock brought in laws to chip away at the legal rights of juvenile offenders. Abortion rights? Why is it in the survey? None of the parties is going near that issue now. Gay marriage? The Tories say they won’t change the status quo. Euthanasia of very sick people? Who’s for that? Yes, the CBC Vote Compass is stacked. To be anything but a Liberal, you have to dig deep and pretend you are against gays, immigrants, poor people, deficit spending, “Quebec is a Nation” and the environment. You have to want to keep the army in Afghanistan, ramp up spending for the Department of National Defence. To rank as an NDPer, you have to literally coddle criminals, want the country wide open to immigration, favour separatism, and desire to tax rich people and corporations into poverty. Anyone who shows anything like moderation or an open mind defaults Liberal. Vote Compass points the way to the CBC’s view of the Tories, but it has little to do with the party that has been governing Canada for the past five years or the parties that are running against it.